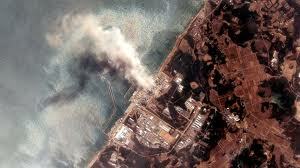 Things are suddenly heating up again with Fukushima. As we reported yesterday, the southern wall of Fukushima reactor #4 apparently collapsed over the past few days, calling into question the structural integrity of the remainder of the containment building (http://www.naturalnews.com/034387_F…). Photos of the failed structure have emerged on Enenews.com, where a report explains that a once-intact wall is now essentially "missing" and that further degradation of the structure could lead to mass evacuations in Japan (http://enenews.com/report-confirmed…). As this report is still not confirmed by other sources, we continue to take this with a sense of caution here at NaturalNews. We will continue to monitor the situation and report any relevant developments. What has hit the mainstream media, however, is a report entitled Impacts of the Fukushima Nuclear Power Plants on Marine Radioactivity, authored by Ken Buesseler, Michio Aoyama, and Masao Fukasawa (http://pubs.acs.org/doi/abs/10.1021…). This report, published in Environmental Science & Technology, reveals that levels of radioactive cesium reached 50 million times normal levels in the ocean water off the coast of the Fukushima Dai-ichi facility. Even more concerning, the abstract of this paper concludes, "…the concentrations through the end of July remain higher than expected implying continued releases from the reactors or other contaminated sources, such as groundwater or coastal sediments." This, of course, contradicts mainstream media reports which for the most part stated that the radiation was "contained" and was not leaking directly into the environment. Only the alternative press has covered the real story on Fukushima, which has now become the worst radiological accident in the history of human civilization. This same study ultimately concludes that this level of radiation contamination of the ocean is essentially harmless, stating, "…dose calculations suggest minimal impact on marine biota or humans due to direct exposure in surrounding ocean waters, though considerations for biological uptake and consumption of seafood are discussed and further study is warranted." That's a conclusion to be viewed with skepticism and caution, of course, as it says on one hand that "it's no problem" and yet on the other hand, maybe you shouldn't eat the seafood because we really don't know what quantity and concentration of radioactive elements may be ingested and concentrated by seafood sources. Another important development now surfacing is that TEPCO has finally admitted that alarming quantities of radioactive strontium (which has roughly a 30-year half life) have leaked into the ocean — and that the leaks are ongoing! • The Fukushima facility remains highly unstable and could dramatically worsen, especially if another earthquake or tsunami strikes the area and causes further degradation of the structural integrity of containment buildings which still house nuclear fuel rods. • The Fukushima catastrophe is, without question, the most massive radiological disaster ever recorded in human history. • The mainstream media has consistently (intentionally?) downplayed the severity of the Fukushima disaster, perhaps to try to calm fears by denying the true extent of the problem. • TEPCO routinely and habitually lied about the status of Fukushima during the meltdown and in the days and weeks following that meltdown. • We therefore cannot rely upon official sources to accurately inform us of the actual status of the Fukushima facility. The risk of being misled by those official sources is very high. Under such circumstances, the wise thing to do is stay informed and get prepared in case the Fukushima situation suddenly worsens. Hopefully everyone in North America knows by now that another release of radiation from Fukushima could widely contaminate the West Coast of the United States with radioactive fallout. Given that government agencies in both the United States and Japan have altered the definitions of allowable radiation exposure limits (http://naturalnews.com/031963_radia…), it hardly seems reasonable to think that these government are erring on the side of caution. In fact, by all accounts these governments are proactively working to downplay the severity of any future radiological event by claiming that levels of contamination previously considered poisoning are now suddenly "within safe limits." But within whose definition of safe limits? After all, the U.S. government also thinks it's perfectly safe for you to drink fluoride, microwave your body at TSA checkpoints, eat genetically modified organisms, get yourself repeatedly injected with chemical adjuvants in vaccines and drink aspartame. Aw, c'mon. What's a little radiation on top of all that?